I actually made this recipe a couple of times in the past month. The recipe below uses beef sirloin which is fairly easy to find at local supermarket chains. Another time, I made this with beef oxtails - a more unique cut of beef that you might be able to find or perhaps order from your butcher. I happen to enjoy oxtails and when I used it in this recipe in place of the sirloin, I found it had much more beef flavor. To use with oxtails, season about 3-4 pounds of oxtails with salt and pepper. Place them in a crockpot and add enough water just to cover the oxtails. Cook on low for 6-8 hours or just until the meat falls off the bone. Allow the oxtails to cool enough to handle by hand. 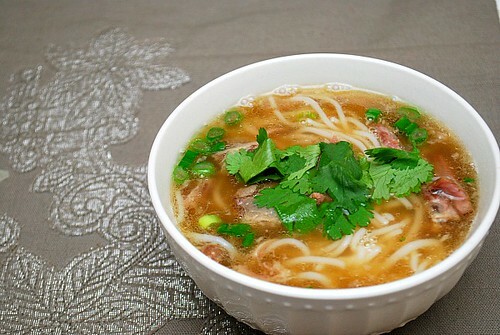 Use the beef stock in place of the broth in the recipe below and use the meat from the oxtail in place of the sirloin. It really was amazing and I imagine the soup would work well with other kinds of beef cuts. Bring broth, soy sauce/tamari, mirin, ginger, and chili garlic sauce (if using) to a boil in a large saucepan or Dutch oven. Add the beef to the pot and simmer, covered, over medium-low heat until cooked through. Meanwhile, cook or warm the rice noodles per package directions. Add noodles into the broth cook, stirring occasionally, until warmed through. Stir in the scallions and cilantro and serve in bowls. Garnish each bowl additional fresh cilantro leaves and a drizzle of 1 teaspoon toasted sesame oil. If you like things on the spicy side, sprinkle a few red pepper flakes for garnish too!